The front gate of my school… do I work in a castle? I know it has been iterated time and time again in various blog posts, but for me, the best part of Indonesia is the young people I have the privilege to work with. This may be why one of the happiest places for me, despite all of the frustrations that invariably come with it, is always my school. This year, I am an English Teaching Assistant (ETA) at MAN Model Gorontalo. MAN stands for Madrassah Aliyah Negri, which means my school this year is a religious institution, in contrast to the SMA I taught at last year. And unlike SMAN 10 Malang, MAN Model Gorontalo has only one campus, and since I live just around the corner, I am able to walk to school rather easily, passing through the gates as the students hurry to morning prayer (no more six am commute by motorbike…there are some days I miss it, but most days I don’t). Because this is my second year teaching in an Indonesian high school, there are certain elements that I hardly notice until someone points them out to me, because I’ve already become accustomed to them. 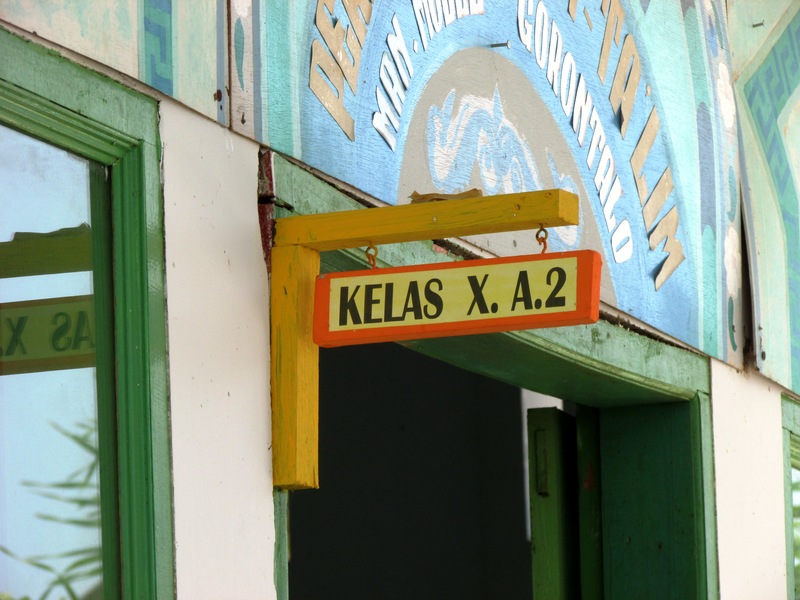 However, there are also parts of MAN Model that are very different from SMAN 10: some of these differences stem from the fact that MAN Model is a Madrassah; some originate in the unique nature of SMAN 10 having two campuses, while MAN Model has only one campus, which is much more common; others are simply present because all schools are different from one another. 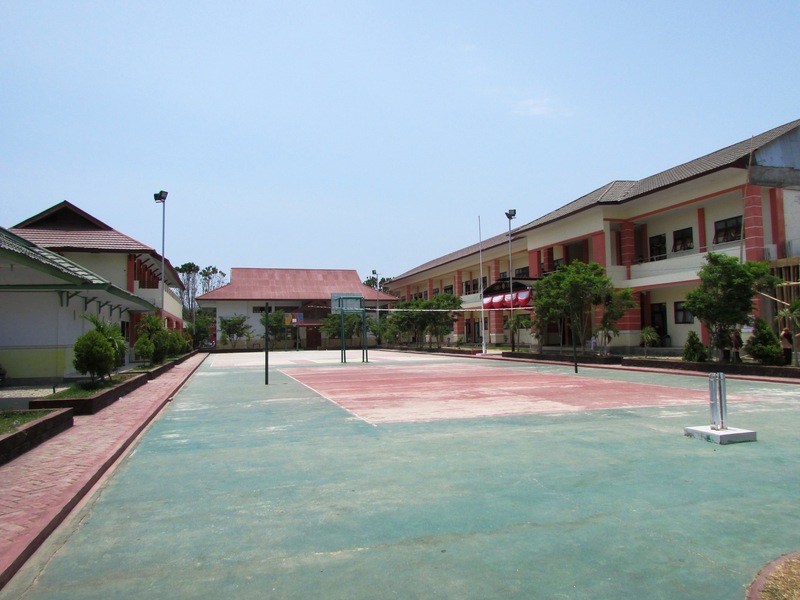 The courtyard where most of the Kelas 1 (Grade 10) classrooms are. My kiddos are always milling about between classes here. One of the most surprising parts of the Indonesian school system for many Americans is the sheer number of classes students take. While in America students might take six or seven subjects (give or take) at one time, Indonesian students take anywhere from fourteen to nineteen (according to the students I’ve talked to about this). This is because while American students might take Earth Science their freshman year, Biology their sophomore year, Chemistry their junior year, and Physics their senior year, a student in the Science track of an Indonesian high school (students in other tracks don’t take nearly as many science courses) will take all of those classes at once, and throughout the entirety of their three years of high school (high school is grades 10-12 in Indonesia). Each subject is then allotted a certain number of hours, depending on which track students are in, and the insane schedule students have every week, Monday through Saturday (no two-day weekend here), is created out of that. It’s a lot to keep track of, on the students part, and it also makes it difficult for teachers to maintain continuity in their lessons. For example, most of my students have English just once a week, for two 40 minute periods (the Language track has English twice a week, but they are the exception to this). To anyone who has ever tried to learn or teach a foreign language, how rarely we are able to meet our students is shocking. And if classes are canceled—due to a holiday, an event on campus, or a teacher meeting—it can often be two or even three weeks between meetings with a particular class. I was not excessively surprised by this schedule this year (my students this year do take a few more classes than my students last year, because it is a Madrassah and so all students have required Muslim Studies and Arabic classes), but I won’t deny that sometimes I still find the schedule a bit frustrating as a teacher. I take comfort in the fact that many of my Indonesian co-teachers feel the same way, and that we can commiserate together. The presence of tracks is also quite different from the average American high school. While some schools in America are tracked, those tracks are most often based on general academic “ability.” Here in Indonesia, they are based on students’ academic interests (at least in theory). The main tracks are Natural Sciences, Social Sciences, Language, and, if it is a religious institution, Religion. Last year, my school only had Science and Social tracks, because with two campuses the population on each campus was not big enough to have more than just the two tracks. This year, my school has all four tracks, and I teach a mix of all of them. The sign outside of the tenth grade Language 2 class. Every classroom has a sign outside of it’s door. Though the tracks are supposed to be based on interest, there are invariably opinions about which students are brighter. Science students are almost universally thought to be the smartest students in a school: I have talked to students who have told me that they actually have more of an interest in social sciences or language than natural sciences, but their parents pressure them to enroll in the Science track instead, because they believe this will help them to be more successful in the future; at MAN Model, there is even a Science Excellent class, which is above even Science 1, while there is no “Excellent” class for any other track. Within each track, classes again are divided, this time by ability (I have been told students take a test to determine which class they are in, but I do not know exactly what is assessed). Consequently, within, say, the Religion track, students from Religion 1 are thought to be better students than Religion 2, who are in their own turn thought to be better than Religion 3. Not all teachers conform to this idea. I am not alone in thinking that all students have a diverse set of abilities which allow them to be successful in different areas. 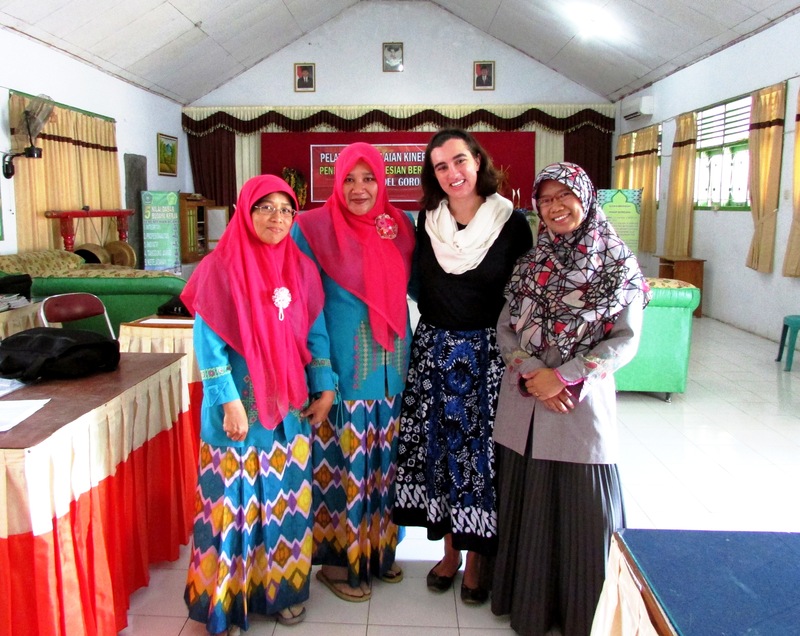 But issues of efficacy are rampant in each of the schools in which I have worked in Indonesia. Students from outside of the Science track are always telling me they are not as smart as the Science students, and teachers regularly echo this same sentiment (indeed, it may be that the students are merely echoing the teachers). As someone who is wholeheartedly a supporter of heterogeneous grouping in classrooms for most situations, I have to admit I’m not a fan of this distinct division of classes, but then, I was never a fan of tracking in America, or the way American teachers always talked about “Honors” students. On the flip side, there is a positive to classes being divided (though perhaps it would be better if they were not divided by “ability”?). 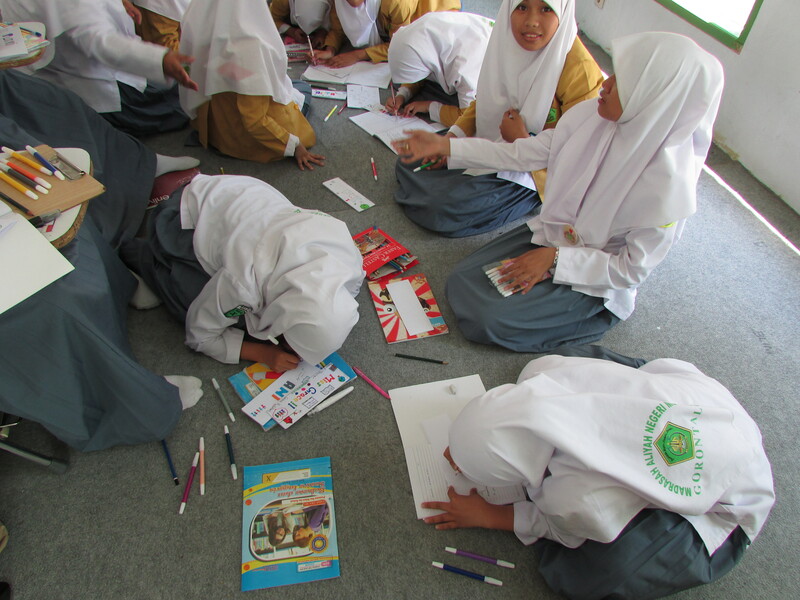 Because each class spends so much of their day, six days a week, together (in Indonesia, teachers go to the students, rather than the students coming to the teacher), each class becomes like a family. In America, each class also has a distinct feel and personality, but I believe the class personality is even more distinct in Indonesia, simply because students spend so much time together. Every time I walk into a classroom, either to teach a lesson or to just hang out during the breaks, I am walking into a family. Dewan Guru, or the Teachers’ Room. 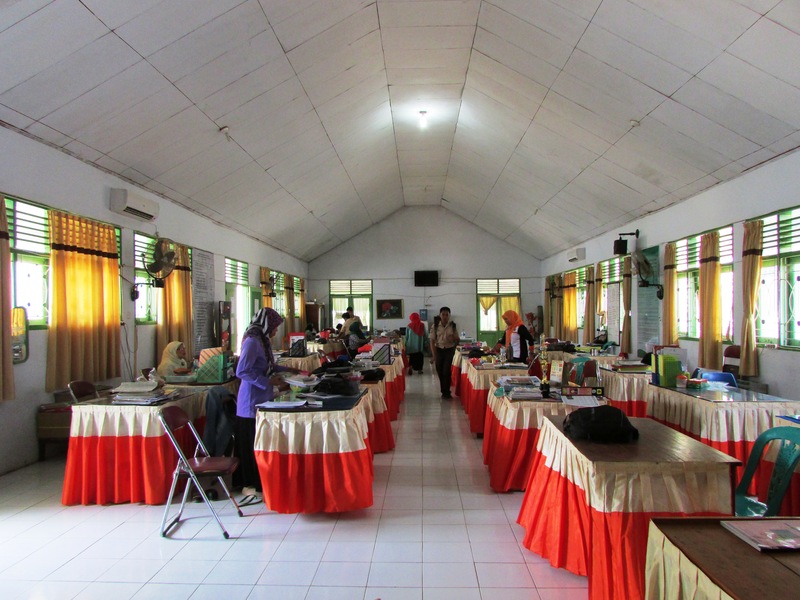 And while the students each have their own room, the teachers have “Dewan Guru.” Last year, with two campuses and multiple teachers rooms, I never got to experience the daunting and fascinating “teachers’ room,” because there were usually only six or seven teachers in the rooms my desks were in at SMAN 10. MAN Model only has two teachers’ rooms, and I am in the main room, my desk nestled in amongst almost thirty other desks. This is where teachers plan lessons, grade papers, chat and complain about their days, nap, share food and occasionally even sell clothing. Me and the ladies. Three of my teachers are Ibu-ibu. The one in grey is also my neighbor, and has the most adorable daughters. The teachers’ room is where I meet with my co-teachers to plan our lessons. I have four co-teachers this year, compared to the two I had last year, three ladies and one gentleman. It is sometimes a challenge to coordinate time to meet with all of them and plan lessons for the upcoming weeks, but thus far we have managed. Each of my teachers has a different personality, both within and without the classroom, but I am learning so much from teaching with them, and loving the laughter that comes from seeing them outside of class. Sometimes I make my teachers participate in class projects along with myself and the students. This is the one male teacher I work with. He is also my counterpart. The teachers’ room is also where I am continuously reminded that I am in a distinctly Muslim institution. When I first came to MAN Model, I was initially asked by many of the teachers (not my co-teachers, but others) if I would wear the jilbab (hijab). Last year, this was never asked of me, because there were already plenty of Christian teachers at the school, as well as Muslim teachers who chose not to wear the jilbab. But at MAN Model, I am the only female teacher whose hair is uncovered. And when the call to prayer sounds, I am often alone in the teachers’ room alone, unless there is a female teacher who cannot enter the mosque at that time. Because Indonesia is a Muslim majority country, this was sometimes even the case last year, so it isn’t all that different, but this is my first time being the only non-Muslim at an educational institution. I’m excited to reflect more on this as the year progresses. No matter where I am at the school—in the classroom, in the teachers room, posted up on some steps with students after school—there is no denying that I have found a place of happiness in MAN Model. I may live off campus this year, but my school is still my home. This is just an example. As I am always explaining to teachers and students here, all American schools are unique places, and because there is more flexibility in what classes a student might choose to take in America, there are also a slew of different ways a school experience could play out in one school. I don’t know that the American system is perfect (how many American students forget most of what they learned in Earth Science or World History by the time they graduate, because it was so long ago? ), but nor do I feel the Indonesian system is the answer either. This year, I am only teaching nine classes, in contrast to the nineteen I taught last year. This has made me significantly less stressed this year: I don’t have as demanding a schedule, and I am actually able to get to know all of my students this year.